Langzhong Ancient City is located in the northern part of Sichuan Province and about 4 hours drive (330km) from Chengdu, the Capital of the province. The city is famous for its time-honored architecture. Currently, of the city's 860,000 residents, over 30,000 still live in the ancient streets and lanes. Surrounded by green mountains on one side and the Jialing River (the third longest tributary in the upper reaches of the Yangtze River, totaling 1,119 kilometers with a drainage area of 159,300 square kilometers) on the other, Langzhong City has been standing for more than 2,300 years. 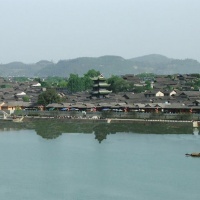 The mountains, river and the black tile roofs of the ancient structures form a natural Chinese atmosphere. Strolling along the narrow pebble lanes tourists might have the chance to experience the different architecture of the past dynasties. Langzhong boasts 92 ancient streets and lanes mainly in the construction style of the Tang and Song dynasties and more than 1,000 ancient streets, lanes and houses register 1.5 square kilometers. The layout of Langzhong's ancient streets and lanes is in the shape of a chessboard. Streets and lanes link with each other, and all lead to the Jialing River. Most of the ancient houses face the north, with their front parts serving as shops and the rear parts being the residences. Supported with a wooden pole, the shops' eaves extend over two meters, sheltering pedestrians from rain and sun. In the town some ancient quadrangle dwellings of the rich have also been preserved, featuring small courtyards, screens and rock works. Gingko, sago cycads and sweet-scented osmanthus trees are mostly seen. The hollowed-out window decorations are popular and are carved in the shape of flowers, birds, animals and paintings. In addition to their artistic taste, the decorations make the rooms brighter. Since the Warring States period (475-221 B.C. ), rulers of different dynasties regarded Langzhong as an important strategic stronghold for governance of southwest China and established government offices there. During their stay in Langzhong, many princes, members of the royal families and government officials of different ancient dynasties were fascinated with its fengshui, or Chinese geomancy (the location of a house or home, supposed to have an influence on fortune of a family), and invited talented architects to build house and palaces. Nowadays, Langzhonbg is valued as one of China's four largest and best-preserved ancient cities together with Shexian in Anhui Province, Lijiang in Yunnan Province and Pingyao in Shanxi Province. In the Chengbei Bus Station of Chengdu, tourists can take the bus from Chengdu to Langzong City. There are four buses to Langzhong every day in this bus station (the other bus stations may have more). Their departure times are: 9:30; 14:30; 17:30; 18:00 respectively. The ticket price of the bus is about 60yuan (RMB). We loved this city so much that we went back to it and spend an additional 9 days. It is very quiet and offers lots of meditative energy. 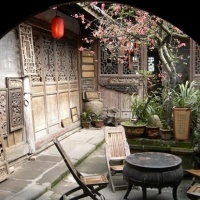 We stayed at the Tianyi Youth Hostel which is located at the Feng Shui Museum....awesome place. We highly recommend making a trip to Langzhong although we are fearful that too many tourists will force it to lose it's wonderful flavour.